My name is Phil Ruse; it has been eleven days since my last post. That’s a rate I was at when I first started this nonsense; so either there’s nothing I have to say or there’s nothing left to say... which might be the same thing, not sure about that. Or perhaps I can’t be bothered. I might edit that bit out, at least I’ll take out the “just”; in the bin with “it’s a fact” (it never is), “in my opinion” (it always is) and a growing collection of other aberrations. I wonder if this will undergo the usual vigorous editing, a savage excision to the point of what’s necessary, and lose its intent in the process. I know, you couldn’t tell, and I should probably stay away from the subject of necessary. I shall therefore pluck random events from the news and hope it doesn’t sound too desperate. 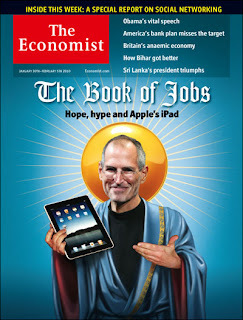 Steve Jobs is dead, long live Steve Jobs. I knew he was ill, but when he resigned from whichever position he resigned from, I didn’t realise how ill. There is a lot about Apple I don’t like, or of which I’m deeply suspicious. I loathe the walled garden, the “money for nothing” results of their app store; you make the software, Apple takes the money, OK, a percentage, but still… And a predatory approach to patents which I acknowledge is partly defensive; you can be quite sure that if Apple were playing nice, some idiot patent trolling company in Texas would be doing it to Apple. I’m not sure the technology was always as revolutionary as reported, but the user experience certainly was; Apple replaced the idea of reading the manual (remember rtfm?) with querying why you should need one. The former CEO of Apple might well have been one of those filthy rich types incurring the wrath of the Wall Street occupation, but since no-one really knows what they want, including the protesters, it’s difficult to say. I’d hazard not, because the Apple chief made his money in smartphones and other tangibles that simple folk can understand. I have some sympathy, because I am simple too; yet for every Steve Jobs we need a Ross Perot for those shiny objects to see the light of day. Some investors, financiers, bankers (whatever you want to call them) become very rich on the back of this, sometimes without risk and yes, this does seem unfair. But if this is all you’re saying (“things must change” isn’t saying anything) then who are you arguing with? Complain about unequal taxation by all means, but don’t dilute the message with a general anti-bankers polemic. The excellent – and frighteningly prolific - Norman Geras wrote an interesting post defending such protest and while the points raised are certainly valid I can’t help but trip to the next step – there’s always another question - what is the alternative? I’m not enamoured with those systems that have tried, as their method restricts that greatest of freedoms, freedom of choice. I stumble to Churchill’s description of democracy as “the worst form of government except all the others that have been tried”, and wish I could be so polite.